spring has arrived…or has it?! THANK YOU FOR SUPPORTING INDEPENDENT CRAFT Beer! Our take on the traditional American cream ale, an East Coast style originally brewed to be an ale version of the standard American lager. Bushels of flaked corn give this approachable beer an elevated sweetness, while still finishing nice and dry. No need to raid dad’s fridge in the garage, we’ve got your gateway to fresh beer right here! Utilizing a blend of new age hops and some time tested favorites, this American IPA packs a citrusy punch with notes of grapefruit zest and ripe melon. The US and UK malt bill leaves enough sweetness to keep the bitterness in check. Enjoy! Our second lager of the year, this blonde bock is composed of a harmonious collection of German-born malts and hops for your listening, er drinking, pleasure! Decadent malt-driven sweet bready notes greet you in the aroma and carry forward through the flavor. Old world hops lend a slight spiciness to the aroma, and deliver just enough bitterness to temper the big malt flavor. Prost! Abundant aromas of fresh-squeezed tangerines, ripe apricot, and a touch of candy-like sweetness backed by plenty of malt to support the large hop charges present in this big beer! Double Down ‘19 features Minnesota grown Comet hops from Mighty Axe Hops! Cheers! A tangerine grove in a pine forest by our own Cannon River? Sure tastes like it to me! Pungent orange and tangerine with a touch of evergreen in the aroma, the citrus carries over into the flavor. Relatively low bitterness coupled with huge hop aroma define our version of a classic American pale ale. Our take on an English pub standard. A pleasantly delicate aroma, with a hint of berry and caramel, followed by a touch of biscuity, dry cracker-like malt flavor offset by a heap of whole cone British hops. A nice dry finish makes for a well balanced, sessionable pint. Cheers! The third installment of our winter lager series, this Vienna-style lager is crafted with Proximity Malt from Colorado and Mighty Axe Triple Pearl hops. Toasted bread and a bit of toffee-like malt sweetness carries forward from the aroma into the flavor, with a bit of spiciness to compliment the dry finish. Here’s to the next 101 batches of Imminent beer! Our second hopalicious creation, this red IPA couldn’t wait any longer to get into your glass! Some caramel malt sweetness with a touch of roast and a firm American-hop flavor yields to a bouquet of floral, piney, and citrus aromas! Enjoy! Loaded with local Carmine Jewel cherries from our friends at Cherry Leaf Farm, this beer showcases the versatility of this particular variety. The aroma features the fruits’ sweetness, layered with malt-driven dark chocolate and a slight roastiness. Just enough of the cherries’ tartness comes through in the flavor, balanced by a bit of sweetness from the addition of milk sugar. Enjoy! Malt-forward big brown ale with biscuit, toasted bread, and hints of dark stone fruit present in the aroma that carry forward into the full-bodied flavor. A touch of American hops keeps the malt in check. Throw one back for Betty Lou! Need a quick gift for the beer lover in your family? Our thanks to the Jones/Kucera family for sharing Keva with us! Keva is an 11-year-old Norwegian elkhound. She is a sweet, gentle dog who loves snow baths, the polar vortex and people. She goes to the dog park more for the people than the other dogs. She was born on St. Patrick's Day 2008, so we* gave her the Gaelic name "Caoimhe", pronounced KEE-vuh, meaning "gentle and beautiful", and she lives up to the name well. Norwegian elkhounds are very mellow, intelligent and loyal dogs, and Keva loves just hanging out with her family pack. *Imminent Brewing invites well-behaved, leashed canine friends to hang out with their humans in our taproom. Please see FAQs for more info. We will be closed on Sunday, April 21 for those on our staff who celebrate Easter. Rent the tap room for your special event! We work really hard to build good relationships with our local neighbors. You can help! Even when it's busy, please restrict your parking to street parking only and avoid using Family Fare's parking lot. There is on-street parking available on 6th, Division and Washington Streets! Pete's Chiropractic, located east of the brewery, is open on Fridays and we ask our customers to avoid the parking spot right in front of his office entrance on 6th street until after 6pm. Q: Do you serve wine or cider? A: We do not, unfortunately, because we can't. Our license allows folks to only consume the beer we make on this premises. For this reason, we cannot allow outside alcohol at Imminent. We always encourage folks to write to MN state legislators in the hopes that we can change this law. We'd love to have Keepsake Cider on tap! Owners must maintain control of dogs at all times. Dogs must be on a non-retractable, standard leash no longer than six (6) feet while on premises. No dogs behind the bar or in production areas. Please keep your pup out of aisles where people are walking! A current Animal License must be affixed to a properly fitted collar. Dogs must get along with people and other dogs. Dogs must stay on the floor. No dogs on furniture or laps. Dogs may eat/drink ONLY from separate dog bowls on the floor. If you have additional questions, please use our contact form below or give us a shout at (507)-646-2327. Thanks! We offer private tours on Thursdays at 4 pm. Cost for a private tour and tasting is $5 per person and includes a 20 minute tour and two 5-oz tasters of the current beers of your choice. Scheduling is at our discretion and must be booked at least 2 weeks in advance. Please fill out the "Contact Us" form below with your information. At Imminent Brewing, we firmly believe in supporting our community. Although we would love to donate to every charitable event, we receive more requests than we can support. We focus on local causes and branch out to a few that are near and dear to our hearts in nearby communities. We are not equipped to host special events during taproom hours. Our neighbors at Armory Square have a beautiful event space available for rent. Contact them on Facebook. We welcome small gatherings (bday party, bachelor party, etc.) during taproom hours. *Please let us know in advance if you plan to bring more than 25 people - that way we can schedule staff accordingly to give you and all our guests a better experience! Reserve tables in advance? Nope. Bring in my own food for an event? Yep. Bring in my own alcohol? Definitely Nope. Book my own band? Nope. Request a band? Sure. We’ll listen and make the final call. nab some tables? Yep - about 15-30 min. Favorite beer: Currently, Peche Flanders Style Blonde from Culmination Brewing in Portland. I never thought I’d say that about a fruit beer, but there it is…A forever favorite is New Belgium’s Two Below. New Belgium was the first craft brewery I grew to love for their delicious brews, beautiful vision and their wit! Randy was first exposed to fresh, local beer as an exchange student in West Germany (yes, that was a long time ago!) After college and years of bland macro-beer, Randy headed west to Colorado. Being the mid-'90's, he found himself in the midst of a burgeoning craft brewing scene. Managing fine dining restaurants presented the opportunity to share his new love of microbrews with customers and friends. He began his home brewing career in 1998 when his future wife gave him a kit for their first Christmas back in Northfield. Over the years he discovered he really enjoyed the art and science of this marvelous craft. In an effort to improve his skills, he joined a few home brew clubs, entered contests and became a certified beer judge. His love for making beer grew to match his love for sharing it. 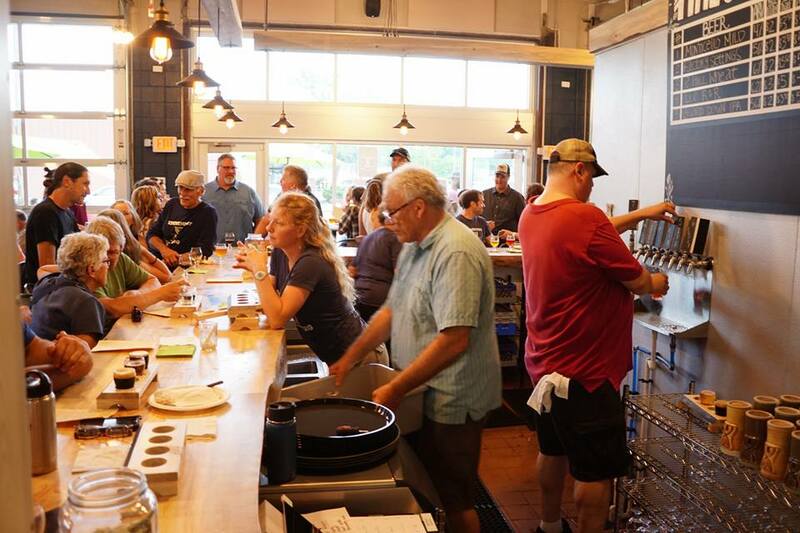 Having planted firm roots in this town he calls home, he eagerly awaits the opportunity to bring local, delicious, and varied craft beers to Northfield. In 1994, the “townie” of the group, took her St. Olaf art degree and headed to Colorado to experience life outside of Northfield. This is where she found her future husband and also the wonderful flavors of microbrews. She noticed each brewery had their own unique label and this is one of the things that inspired her to pursue graphic design. 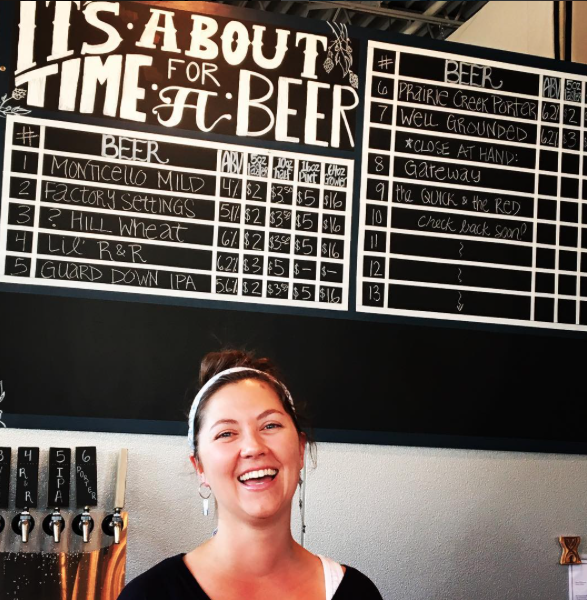 While balancing her freelance business and 4 kids (2 teens and twin 8 yr old boys), she will use her design and marketing skills (with help from her marketing friends) to help promote Imminent Brewing as a place people from all over MN will want to visit. 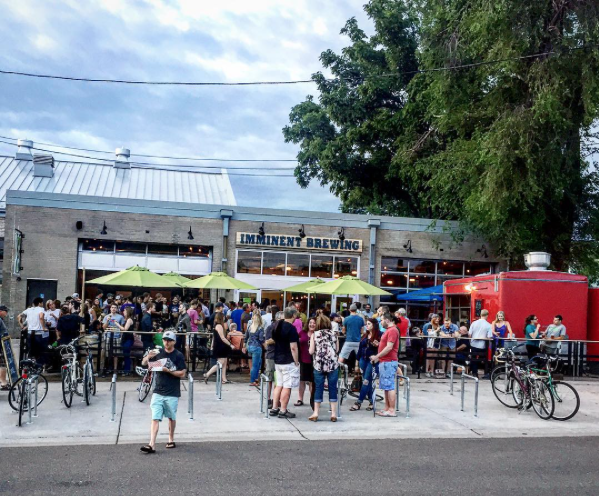 She hopes the taproom is a comfortable and inviting place for all ages to rest or play, spend time with friends & family, and of course to enjoy a favorite Imminent brew.